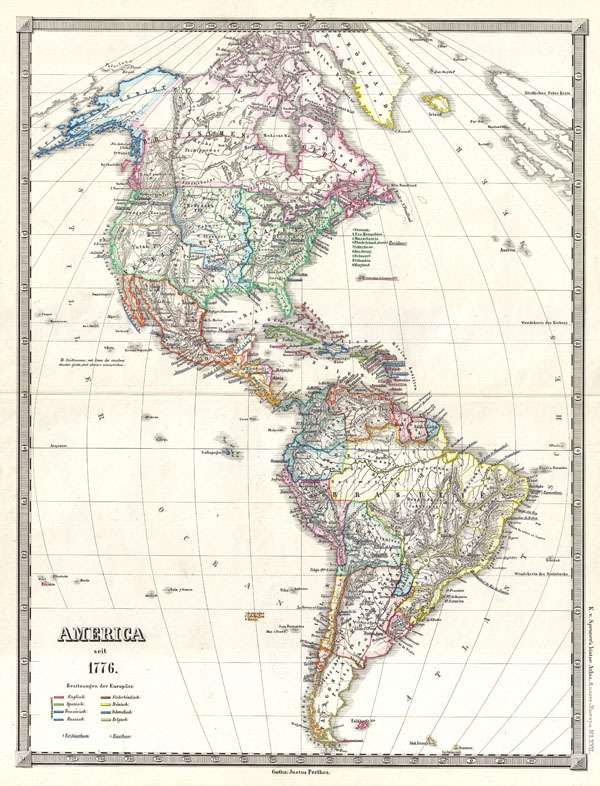 This is Karl von Spruner's 1855 map of North and South America 'since 1776,' including Greenland to the North, Tierra Del Fuego and Falkland Islands to the south, and the British Isles and Scandinavia in the upper right quadrant. The map shows locations of indigenous groups, color-coded European possessions, and perhaps most importantly, the political boundaries and name of the newly formed United States. Compare to Plate 16, 'America seit 1776' ('America since 1776') with which this would make a nice companion piece. Relief is shown by hachures, and the finely engraved detail throughout exhibits the exquisite craftsmanship for which the Perthes firm is best known. Justus Perthes published the map as plate number 17 in Dr. Karl von Spruner's 1855 Historisch-Geographischer Hand-Atlas zur Geschichte Asiens, Africa's, America's und Australiens, also known as Histor. Atlas. Ausser Europa.